She doesn't like it when you leave. It’s normal for you and your kitty to miss each other when you’re apart. But for some kitties, the longing is overwhelming to the point of panic. Separation anxiety can affect cats. Whether a "homeopathic" solution exists is debatable; but there are natural and holistic means of helping relieve stress. Separation anxiety is stressful for a cat who suffers from it. 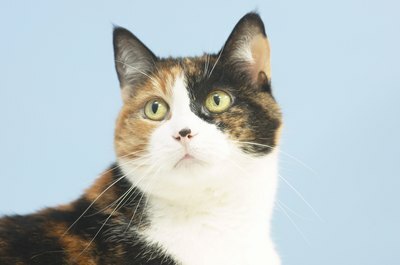 In your absence, she may meow incessantly, inappropriately urinate and defecate, groom herself to the point of baldness or sores, and develop extreme food habits such as overeating or refusal to eat. Because the signs and symptoms of separation anxiety parallel those of other serious medical conditions, it’s important to have your veterinarian thoroughly examine Ms. Kitty if she exhibits any of the aforementioned symptoms. Once your vet has ruled out medical causes, you can discuss a natural approach to kitty’s behavioral issues. Natural and holistic medications have natural active ingredients, as opposed to conventional medications, which are often derived from man-made chemicals. They often come in liquid and spray form or as pellets that do not need to be swallowed, merely tasted -- perfect for kitties who hate taking pills. Flower extracts such as valerian and passion flower, herbal extracts, pheromones, minerals and essential oils such as rosemary and lavender are calming ingredients found in natural feline anxiety medications. These ingredients support your kitty’s nervous system, working to naturally lower her anxiety. Valerian root is a popular floral extract found in many natural anti-anxiety medications. It works to naturally lower your kitty’s blood pressure and heart rate, though it requires consistent, repeated treatment for optimal effectiveness. According to "Webster's New World College Dictionary," homeopathy is "medical treatment based on the theory that certain diseases can be cured by giving very small doses of drugs which in a healthy person would produce symptoms like those of the disease." In a sense, pheremones are homeopathic: Pheremones are a secreted or excreted chemical that one animal exudes to trigger a social response in like-species creatures. Pheromone-derived products specifically for cats are sold in pet stores and vets' offices. When you diffuse a spritz of the bottled liquid substance, a cat's olfactory membrane detects it; some cats get noticeably calmer. Natural medications often come with less overdose and side-effect risks than traditional medicines. Natural and holistic medications can be tailored to your cat’s individual symptoms and needs. Holistic veterinarians often mix and prescribe unique strengths and combinations of homeopathic and natural extracts designed specifically for your kitty. This is quite different than conventional medications, which employ a “one-drug-fits-all” approach. All-natural medications aren’t necessarily a cure-all treatment for anxious kitties; holistic medicine is a good approach for anxiety issues because it attempts to treat the "whole" of the animal's life -- diet, environment, physiology and more. When it comes to severe separation anxiety, natural treatments work better in conjunction with behavioral modification and environmental changes. Discuss these approaches with your veterinarian or a licensed feline behaviorist if Ms. Kitty gets a separation anxiety diagnosis. Colorado State University Veterinary Teaching Hospital: Valerian Root: Herbal Valium? What Kind of Murmur Does Hypertrophic Cardiomyopathy in Cats Cause? Can Dogs Become Too Attached to Us? Can Cats Lose Interest in Their Food?